Horses were fundamentally important for mankind: for pleasure, as workforce, in war, in agriculture, in trade, commerce and for status. To ensure their good welfare was imperative. The first text, Lo cavall. Tractat de Manescalia is anonymous, but the Catalan text is part of the tradition established by Giordano Ruffo’s De medicina equorum. The second text, Libre dels cavayls que compòs Ypocras is a Catalan translation of Theodorico de’ Borgononi, Practica Equorum - Furthermore there are recipes and various drawings of bits for horses. 286 x 210 mm. – 81 leaves, vellum + paper. With a large pen-flourish initial and 80 small drawings on four pages. In the medieval world, the horse was 'everywhere' and much more than ‘just’ an animal. The horse was the symbol, par excellence, of the nobility and of all those involved in military or knightly duties. As horses played a crucial part in the noble man’s identity, treatises on horses contributed to the education of the knight. Not surprisingly, there exists a whole genre of medieval texts on horses, their use and care. The texts in this manuscript deal with the anatomy and physiology of the horse, the qualities that must be present for selection for breeding etc., as well as the description of a number of diseases, the explanation of remedies, and recipes for healing, bits to be used, etc. The work is methodical, of great clarity, and offers a lively view of the state of veterinarian medicine around the middle of the 15th century. The first text, Lo cavall. Tractat de Manescalia comprises an unrecorded treatise by an anonymous author on the 'government' of horses and the treatment of their illnesses in the tradition of Giordano Ruffo's De medicina equorum. 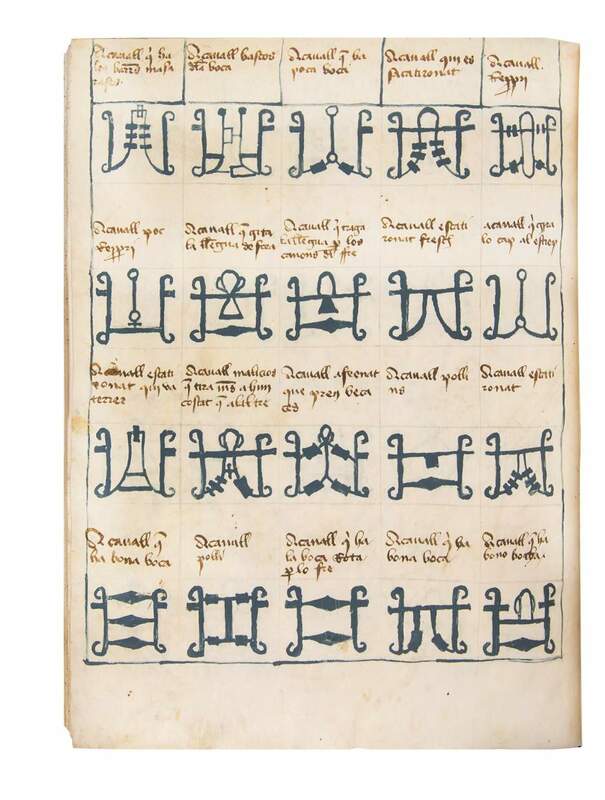 The second text is an anonymous translation of the Practica equorum by Teodorico de' Borgononi, followed by 80 designs of bits for horses of various sizes and temperament, and reminiscent to those in Manuel Diez's, Manual de Menescalia. Dated to the year 1450 this manuscript also adds to the vocabulary of medieval Catalan. Catalan manuscripts seldom come to the market.